Lionel Messi was at his best once again as he guided Argentina past USA to reach the 2016 Copa America Centenario final. 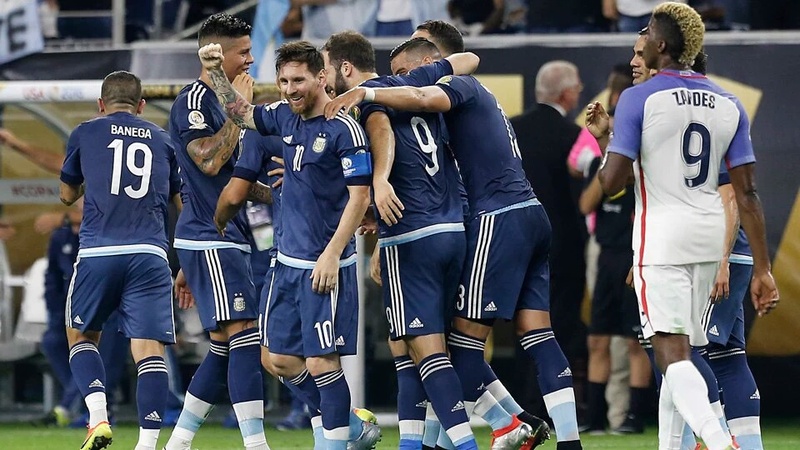 Messi scored a sublime free kick and provided two assists as Argentina defeated the USA National football team 4-0 in Texas, meaning Argentina reach their fourth Copa America in the last five editions of the tournament. Lionel Messi equalled Gabriel Batistuta as Argentina’s all-time top goalscorer with his goal against Venezuela but has now broken that record courtesy of his free kick wonder against the USA. He now has 55 goals for the Argentina national team, one ahead of Gabriel Batistuta with 54. USA didn’t settle well in the early stages and paid the price after just three minutes, losing possession to Messi who made a sublime chip pass to set up Lavezzi for the unmarked player to head home the opener. Messi then had the chance to make it 2-0 five minutes later but the star could only fire over after good work from Ever Banega to set Marcos Rojo up who made a beautiful cross for Leo. Messi was everywhere and could’ve gotten Argentina’s second on 14 minutes but Guzan was on hand to save his effort. The player also set up Gonzalo Higuain later on with a quick free kick but USA player Geoff Cameron made a beautiful tackle to stop the chance. Argentina’s second was only a matter of time and it came on 32 minutes. Messi was fouled close to the box and the FC Barcelona man stepped up to take the free kick and unleashed an unbelievable curler to the top right hand corner that left the goalkeeper stunned. It was Messi’s 5th goal of the tournament, his second from a direct free kick, and his 55th for Argentina, surpassing Batistuta. USA didn’t test Sergio Romero the entire game and Argentina made it 3-0 five minutes after the restart after USA lost possession in midfield to Lavezzi who found Higuain with a pass and the Napoli player scored with the second time of asking. Lavezzi picked up an injury later on but it didn’t affect Argentina who were in total control and they got their fourth goal on 86 minutes after Lionel Messi gained possession to set up Higuain who slotted in to fire Argentina into their fourth Copa America final in the last five editions. Javier Mascherano also started for Argentina and played the whole game. Messi registered one goal and two assists and was presented with the Man of the Match award once again. Argentina come up against Colombia or Chile in the final as they seek their first major trophy in 23 years.